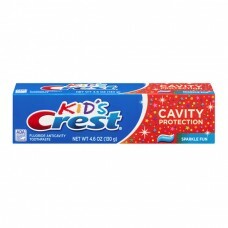 Kid's Crest® Sparkle Fun Cavity Protection Tooth Paste. ADA. Accepted. American Dental Association®. Fluoride anticavity. Use: Helps protect against cavities. The ADA council on scientific affairs' acceptance of Kid's Crest sparkle fun is based on its finding that the product is effective in helping to prevent and reduce tooth decay, when used as directed. Fluoristat is a trademark for a proven decay-preventive composition (active ingredient: sodium fluoride). This product contains no sugar, like all ADA accepted toothpastes. Fights cavities with clinically proven Fluoristat®. Gentle on tooth enamel. Fun filled sparkles and sparkle fun flavor for kids. Questions? 1-800-492-7378. www.crest.com. ©2010. Adults and children 2 yrs. & older: brush teeth thoroughly after meals or at least twice a day or use as directed by a dentist. Do not swallow. To minimize swallowing use a pea-sized amount in children under 6. Supervise children's brushing until good habits are established. Children under 2 yrs: ask a dentist.